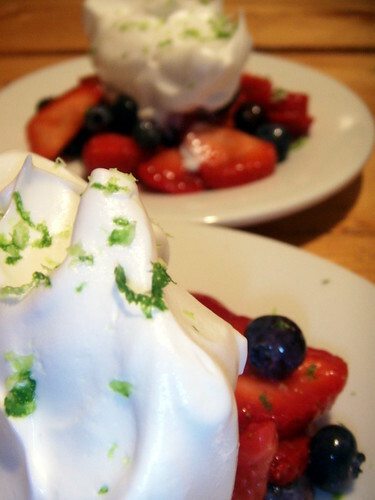 fresh lime meringue and berry dessert, originally uploaded by aarn! +30th July, 2008+. needed something terrible for the body following an after dinner walk. the strawberries and blueberries just needed something. there wasn't any heavy cream for whipping, but there was a carton of eggs and a half of a lime on the cutting board. whipped a couple of egg whites with a pinch of cream of tartar, the juice from the half of lime, and an arbitrary amount of confectioners sugar into a fresh and delicious lime meringue. tossed the meringue on the fruit and garnished with some lime zest. You know about Pavlova's of course, right? But they are not a spur of the moment type thing, I suppose...This looks great.